On Oct. 11, participants across the state all “crunched” together at noon for the 2018 Great Lakes Great Apple Crunch. The event was part of the multistate National Farm to School Month. The diverse mix of registered sites included schools, garden and after school programs, juvenile justice centers, residential programs and other organizations. 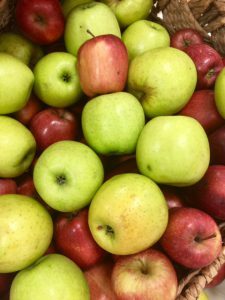 Illinois topped the region in celebrating local apples with 582,711 total crunches across our state. That’s 1,226 individual sites with 1,178 preschool crunchers; 570,115 kindergarten through grade -12 students children, and 11,418 adults all crunching into locally grown apples. Across the region, in Illinois, Indiana, Ohio, Michigan, Minnesota and Wisconsin, a combined total of 1,563,153 crunchers participated. You can view the official 2018 Illinois Great Apple Crunch report and all previous reports (2015-2017) here. The Crunch in Illinois grew by 24.2 percent from 2017 to 2018. Next year, we anticipate Illinois’ participation to surpass 600,000 students and adults. Local and regional apple purchases have grown as well. Sites purchased local apples through their foodservice or directly from local vendors. 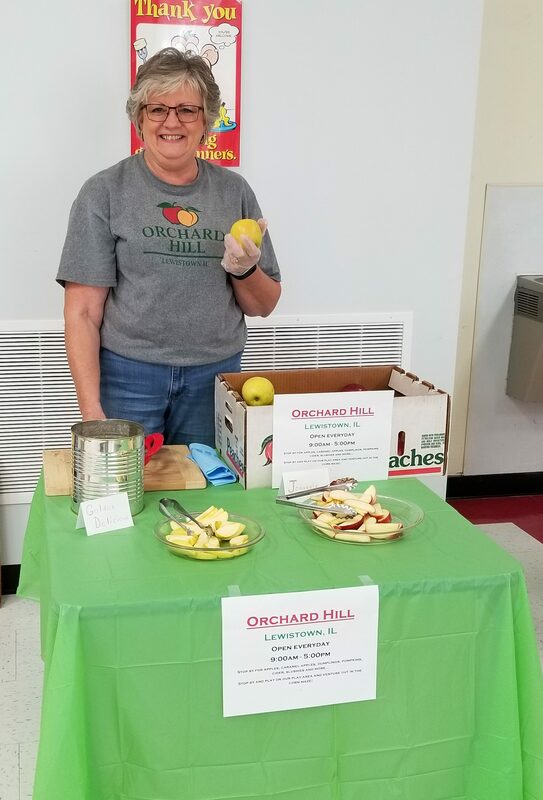 Some local suppliers included Get Fresh Produce, Inc. in Bartlett, which sourced apples from Rendleman Orchards in Alto Pass, and Flamm Orchards in Cobden to supply 60,240 pounds of Illinois Apples to 310 schools (an increase from last year of 9,880 pounds and 57 schools). Cristina Foods, Inc. in Chicago distributed approximately 8,000 pounds of Michigan McIntosh apples. Kuipers Family Farm in Maple Park supplied one school with 648 pounds of Fuji, Empire and Jonathan apples. Central Illinois Produce, Vermilion Valley sold 4,000 pounds of Illinois apples for the Crunch; and FarmLogix moved 167,919 pounds of apples from Michigan and Indiana to multiple school buyers during Crunch Week. Sites employed a variety of tactics in their celebrations. 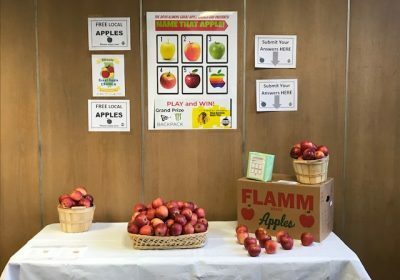 They had participants bit into local apples together in cafeterias, hung up new annual Illinois Great Apple Crunch posters, used apple-based recipes and taste tests, got local media involved, and much more! 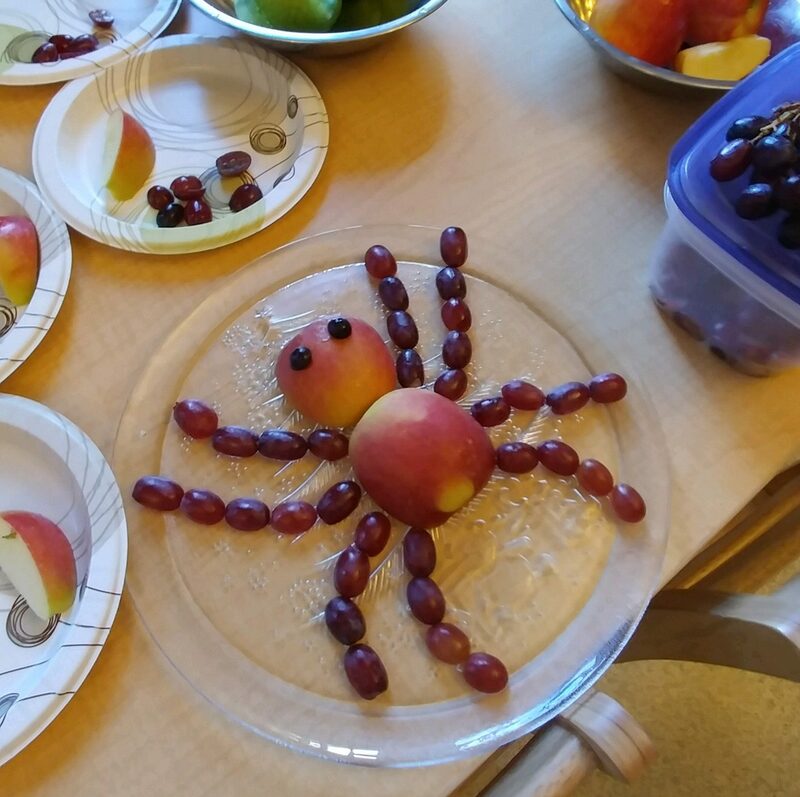 Oak Park Day Nursery shared a lesson with Sandy Noel, a visiting food educator, and created fun “apple spiders” and served cinnamon apple chips made from local apples. A teacher at Bethel Grade School donned an apple costume and handed out apples at lunch. Students at Mooseheart Child and City School created their own Apple Crunch posters. Lewistown School District 97 featured a taste test in the cafeteria with different varieties from their hometown orchard. Chicago Public School Luke O’Toole Elementary featured a taste test with middle school students who ranked their favorites. Beaupre Elementary School had a visit from the USDA’s Office of Community Food Systems’ director and Midwest Farm-to-School Regional Lead (see more here). Wheeling Community Consolidated School District 21 celebrated with a handmade photo frame. IFSN staff joined two sites on Crunch Day to help celebrate and broadcast: the Oak Park Day Nursery and East Aurora Preschool. Other sites, such as St. Francis Solanus in Quincy, and Buncombe Grade School in Vienna, also shared their Crunch online and with local media outlets. 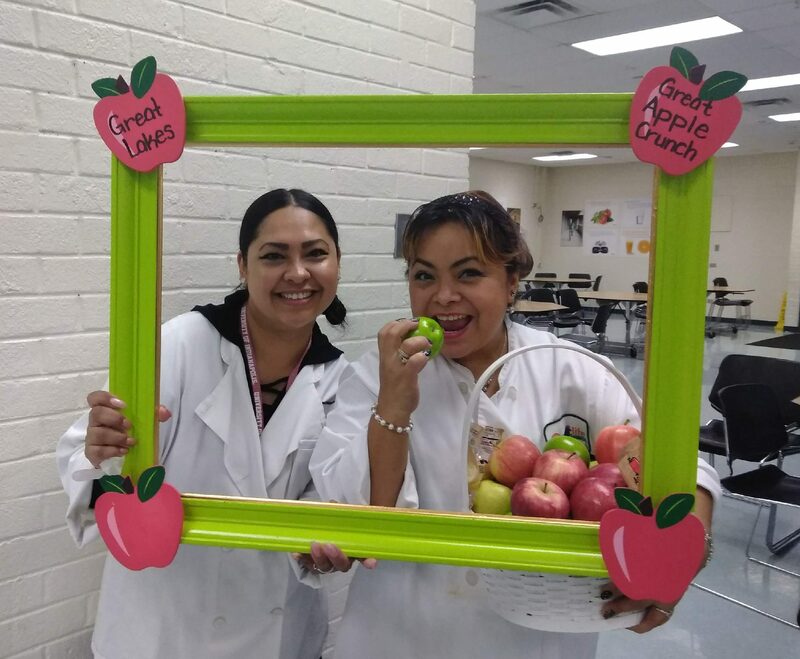 Registered sites shared their photos of all things Crunch with us and on social media using the hashtags #GreatAppleCrunch, #ILapplecrunch, and #F2Smonth. You can still your Crunch photos with us on the “Send us Photos” tab on our Apple Crunch page. Thank you for making this our biggest Crunch ever, and see you next October for the 2019 Crunch! A change of season and an opportunity for change. When you choose to make a change, accepting the work is the first step. Change is not an easy proposition to make. It involves planning, a period of trial and error, and a period of adjustment and acceptance. Then, you rinse and repeat. When a manager or director of a child feeding program chooses to make a significant change in their program, the prospect of an increased workload, combined with the effort needed to make successful and cost-effective changes can feel arduous. Making changes to a prescriptive feeding program involves a series of decisions, which at any time can cause a domino effect, and in short, nothing less than a disaster. This apprehension of uncharted waters and the daunting work ahead can bring about what I refer to as the false start syndrome. 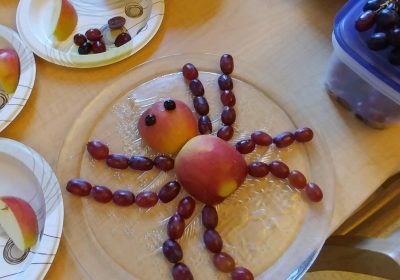 Enlightened managers who want to shift the balance on the lunch tray and create a healthier way to engage kids at mealtime can sometimes become a deer in the headlights once they’ve made the commitment. This happens more than one would think. As program manager for the Illinois Farm to School Network, I see false start syndrome happen to the most determined managers in feeding sites large and small. As a former school food service director, I understand the immense workload tied to the overwhelming program regulations and requirements. This is not Grandma’s kitchen, nor is the process of program management open for interpretation. Nevertheless, I chose to make changes to my school programs and trudged through the extra workload to make those changes successful. I’m not saying this was an easy thing to do. In fact, it took two years of trial and error and rewriting my original plans to create the program I believed my kids deserved. My vision didn’t stop at procuring locally and posting cafeteria signage. I wanted more. It took months of training and elevating all of my staff to take on these changes. After all, change touches everyone and everything. From the lunchline computer operators to the janitorial staff who maintained the commons area, to the many kitchen staff and the van drivers delivering to satellite sites, to the kids themselves. Everything, attitudes and perceptions alike, eventually changed. I got past that scary starting point. I jumped in and developed a plan of attack to bring in local, whole foods from area producers and begin to cook fresh foods once again. It took longer days to visualize, research, and write down the processes needed to begin scratch cooking in my kitchens. It took multiple seasonal bids and conversations with local growers to develop our local foods procurement process. It took fundraising and school policy changes to make food service the authority on food again. It took training, and then more training for staff. It took dedicated staff members and an even more dedicated administrator to see this vision become a reality. It took patience and it took time. I shared my vision with everyone. My then determined kitchen staff went from opening boxes and cans and loading ovens to cooking recipes in tilt skillets and floor kettles. There were months of adjustments and what we commonly referred to as the rollercoaster of food waste- first rising frighteningly, and then dropping like a stone leaving us stomachless, dizzy, and giddy. My staff persevered through late afternoon meetings and yet more adjustments to our routine and process, rearranging cafe service lines and incorporating self-service everywhere possible to free them up for valuable prep and cooking time. Eventually, with our feet under us, my newly minted staff began sharing recipes from treasured family cookbooks for consideration and conversion into the program. They ran taste tests and recipe surveys with a sense of pride that previously was not evident. They took possession of a burgeoning program that involved the students, the staff, and families at home. They truly owned it. And, our kids? As we reduced the frequency of exposure to heavily processed foods, their taste for whole, fresh foods grew. Parents took notice. Staff lined up with our kids to buy lunch. And, neighboring districts began to ask “how”? I got past my initial false start syndrome. Did you hear that? That’s the sound of Illinois Farm to School participation on the rise! 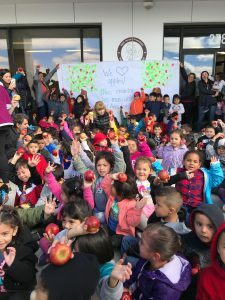 “CRUNCH!” That was the sound heard across Illinois yesterday as 350,000 students took a bite out of local apples in cafeterias, on playgrounds, and in their classrooms. 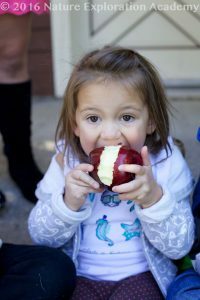 The second annual Illinois Great Apple Crunch, a part of the Midwest Apple Crunch and inspired by the Food Day Apple Crunch, has taken apples out of Illinois orchards, literally, and placed them into the hands of Illinois students. Well, you’d be wrong. Let me explain. It’s true that children have a propensity toward eating apples. Apples make up the second largest category of fruit eaten by school-age children in our country, with bananas topping that list. Kindergarten students sing songs about Johnny Appleseed, a real American pioneer nurseryman by the name of John Chapman who introduced apple trees to large parts of Pennsylvania, Ontario, Ohio, Indiana, and Illinois, as well as the northern counties of present-day West Virginia. And, you can trace apple lore all the way back to the beginning of our country’s history. 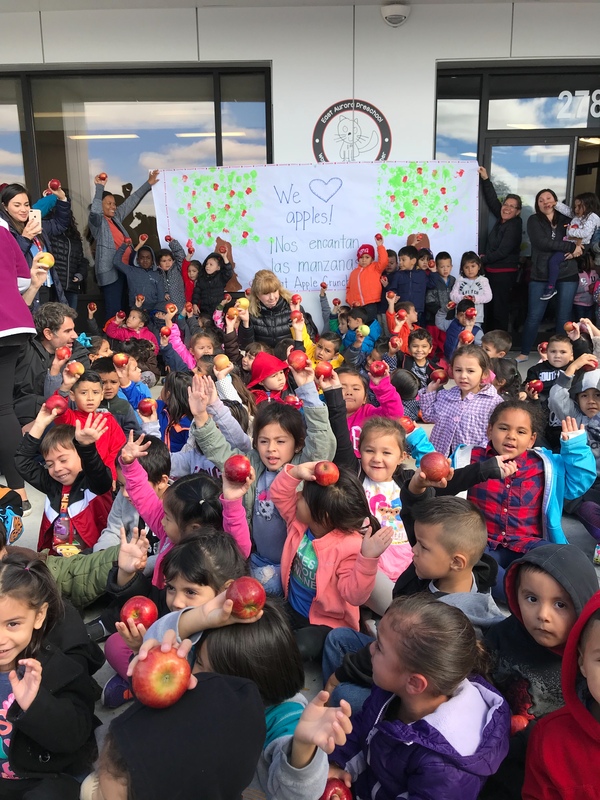 Apples have inspired songs and popular sayings like “An apple a day keeps the doctor away!” and “As American as apple pie!” So, why all the fuss when Illinois students bite into apples on a beautiful, sunny day in October? Local. A very powerful word. Education. Another, equally powerful word. 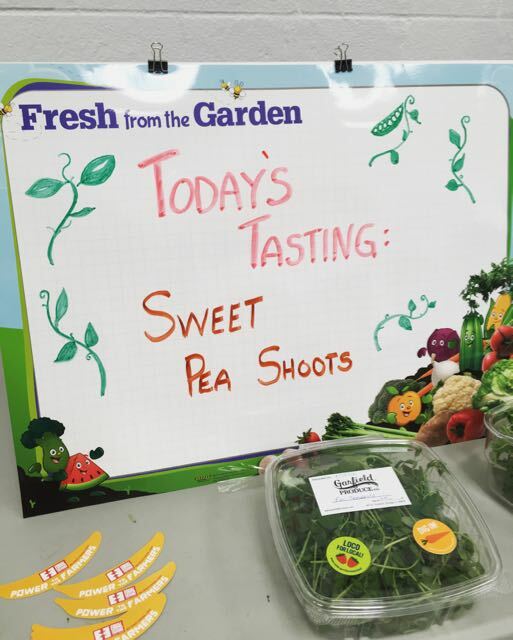 When you incorporate both into a school activity designed to reach thousands of kids across our state you begin to make a change in how those kids perceive fresh food, and who sells those fresh foods to school programs. How can Illinois school children biting into Illinois apples not be a win/win? 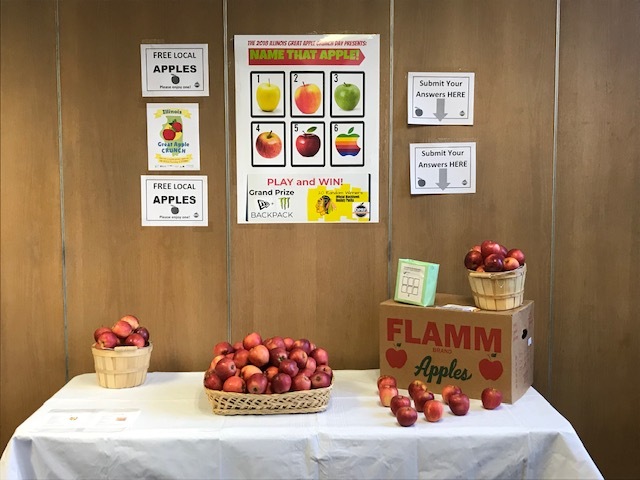 Yesterday, our office joined the Apple Crunch festivities at Rockford Public Schools, along with Acting Branch Chief Eleanor Thompson of the Food and Nutrition Service (FNS), Midwest Regional branch. We were excited to be part of this event for two reasons. First, this was Rockford Public School’s first foray into the Great Apple Crunch. And, second? This is the first time our state stood firmly in the lead for Apple Crunch participation during the Mid-West Crunch! Yes! That last fact is very telling, indeed. 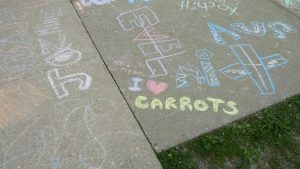 It tells us that schools across Illinois are beginning to participate in farm to school activities. And, as more and more districts begin activities integrating farm to school into their lunch programs and classrooms, local foods and food education are slowly taking center stage. As of yesterday, Rendleman’s Orchard in Alto Hills, IL, an Illinois Centennial Farm and a supplier to the Crunch, was sold out of smaller sized apples. Those small apples have the least amount of “marketability” for local growers. And, selling out of small apples? That was a direct result of participation in the Illinois Great Apple Crunch. I want to thank you for all the work you have done to promote healthy eating and local produce in our Illinois schools. The movement also has a huge impact for family farms and the Illinois rural economy. It was exciting to see our apples in the school’s cafeteria through the picture attached. Thank You! More local food being purchased by local schools. More student education on nutrition and whole foods. Really, what’s not to love? The first school year of our USDA Farm to School grant is over, and we have done a lot out in Kane County with some wonderful and motivated schools. We’ve worked with teachers (from art to science! ), food service directors, cafeteria staff, principals, and of course, lots of great students. With the help of the Kane County Fit For Kids program, we have had a lot of success in our three pilot districts of West Aurora SD 129, East Aurora SD 131, and CCSD 300 in the Carpentersville area. 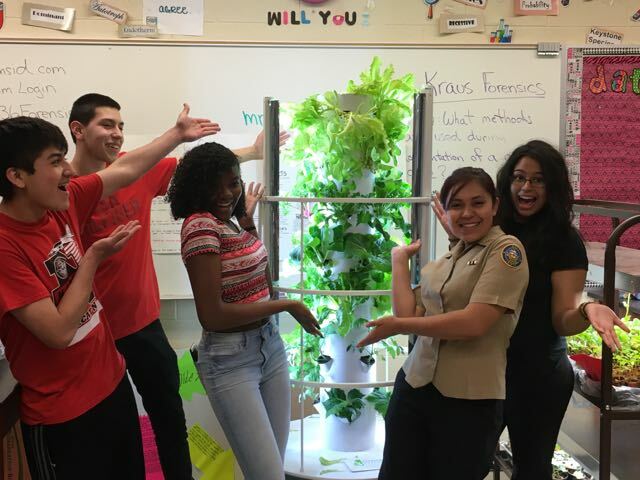 While it took some time in the winter for us to organize our work in the school districts, by the end of the year we were growing and growing – just like the greens on the Tower Garden shown here at East Aurora High School. We installed Tower Gardens across Kane County and will be doing more to share curriculum resources and activities with teachers in the coming school year. In addition to our direct work in the schools, we have also been hard at work behind the scenes to create an Illinois Harvest of the Month program. The goal of the program is to make it easy for school districts to buy and showcase local products on their menus with a monthly featured item. 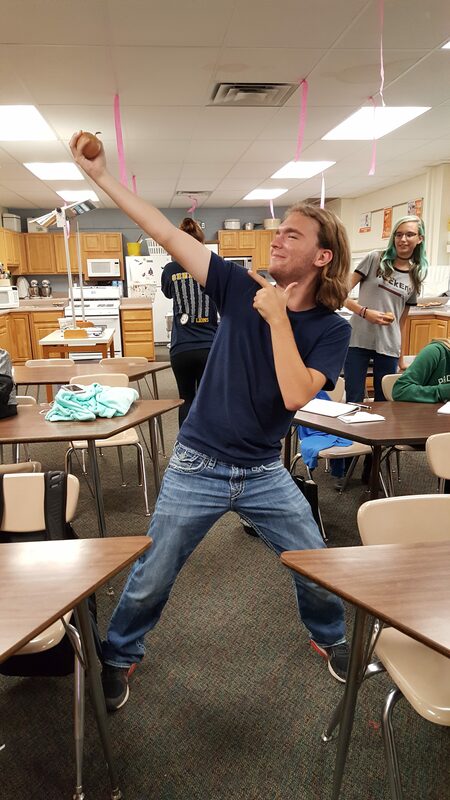 We conducted lots of taste tests at the pilot schools to develop ideas for what foods and activities work best. In the next school year, our three pilot school districts will begin rolling out Illinois Harvest of the Month! More information (plus a new website!) coming soon. We are working hard this summer to prepare for the work next school year. 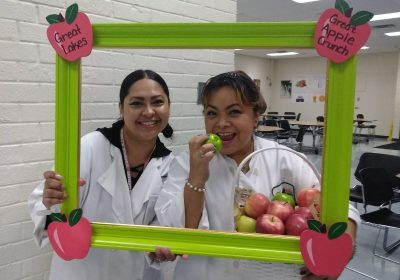 We will do more hands on trainings with teachers, food service staff, and even local farmers to help them learn how to participate in the Harvest of the Month program. What we build through this grant will have a long term impact on farm to school throughout the state, and we could not be happier.